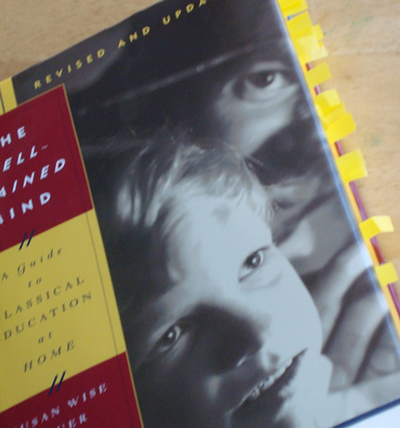 The Well-Trained Mind: A Guide to Classical Education at Home, Revised and Updated Edition is a hefty book that outlines a classical home education from preschool up to the twelfth grade. Susan Wise Bauer, a professor of literature and writing, was homeschooled by her mother Jessie Wise and this book is based on the approach Wise took with homeschooling her three children. I ordered this book when I realized that the eclectic style of our homeschool was not working for Kamikaze. First of all I found that just being available to explore based on his interests with a smattering of Math and Phonics was not enough. By enough I mean that when I suggested making a comic book in order to make writing fun, Kamikaze loved the idea but rejected wanting to write dialogue focusing all of his efforts on the pictures. There are quite a few examples that I could use. Basically, I found that the more structure in our day, the less resistance to challenging work I would get from the kids. I knew I needed a plan, and devising it myself seemed so overwhelming that come the first week of September, I was alternating with winging it and not completing a full week of school because I wasn’t fully prepared or finding that I had planned way too much, and causing some serious burnout. The Well Trained Mind begins with an explanation of what a Classical Education is. According to Bauer and Wise, a classical education is based on the trivium which is a three part process of training the mind. The first part is memorization which takes place in grades one through four and is called the Grammar Stage. In the grammar stage, the focus is on building a strong foundation upon which all other learning is laid. In this stage the focus is on learning facts- the rules of phonics, spelling, math and reading. An excellent point is made about this stage which put a lot in perspective for me. That point being that this stage is not about creativity, it is about teaching the child the tools needed for creativity when he is ready. This is not to say that there is no room for creativity, just that it’s not something that one needs to be terribly concerned about at this point. At various times throughout my child’s schooling I’d try to encourage creative pursuits and, being very creatively inclined myself, was quite disappointed at the lack of interest. There were times that I didn’t worry about it but this quote from page 22 was perfect at a time when I was worried. Young children are described as sponges because they soak up knowledge. But there’s another side to the metaphor. Squeeze a dry sponge, and nothing comes out. First the sponge has to be filled. … Your job, during the elementary years, is to supply the knowledge and skills that will allow your child to overflow with creativity as his mind matures. (Read the extended entry for more about The Well-Trained Mind). The second part of the trivium is organization and is called the Logic Stage in The Well Trained Mind. In this stage (grades 5 – 8 ) the child is ready for more abstract thinking and the questions being asked are less about “What” and more about “Why”. Logic is applied to all academic subjects and thoughts relate more to cause and effect. With the foundations laid in the grammar stage, the child is more than ready to dive into more complicated reading, writing, and math such as writing a thesis and learning algebra. The third part of the trivium is expression and is called the Rhetoric Stage and encompasses the grades nine through twelve. The following description of this stage comes from page 14. The authors make clear that a classical education isn’t just about these three stages, an important aspect of it is that it is language focused. In a classical education a student is trained to get most of their information through reading and listening. Instead of using visuals and games to learn, a student is learning how to learn from abstract concepts and using their own mental images to interpret information. A quote that sums up the benefits of a classical education in this context is what really convinced me that this was THE WAY I needed to home school is found on page 17. Classical education continually asks a student to work against her baser tendencies (laziness or the desire to watch another half hour of TV) in order to reach a goal- mastery of a subject. I had figured out that sometimes there are no tricks to make a difficult subject desirable. However, I knew that Kamikaze would willingly accept to do hard work if it was part of a predictable routine. The past two weeks of implementing The Well Trained Mind‘s recommendations has been proof of that. Kamikaze is being challenged now more than ever but there is a lot less whining and complaining about it. As we get through each subject he’s asking, “What’s next?” with a smile. I think meeting these goals is helping with his self confidence, not to mention his handwriting. Something I found intriguing and worth noting is how The Well-Trained Mind suggests we approach history and science. Based on the idea that all knowledge is interrelated, history and science consist of three repetitions of the same four year pattern through all 12 years of education. You study the ancients, the medieval period through early Renaissance, the late Renaissance through early modern times and modern times to the present. For example the child studies the ancients in first, fifth and ninth grade with the level of complexity appropriate for the child’s maturity level. What is good about this is that a framework was established in the first grade and in the fifth grade that framework is fleshed out in depth. Science is approached in the same way with the four year pattern corresponding to the periods of scientific discovery. For instance biology, classification, and the human body are studied in the first and fifth grade. These were subjects known to the ancients the child will be learning about in history. Physics and computer science are taught in fourth, eighth and twelfth grades which are subjects that correspond to the modern period of history that the child will be studying. I loved this. Reading this approach to science and history got me totally excited to finish the book as soon as possible so that I could start right away. I had always wanted to approach these subjects in this way. I had simply thought that I was going to have to invent it on my own. NO NEED! The Well Trained Mind did it for me. That’s not to say that I don’t feel there are some things that I’ll have to make up on my own, for instance I’d like to do an extensive perusal of Latin American history as well as the occult sciences but with the rest of this stuff taken care of, I can focus on creating these aspects of the curriculum using The Well Trained Mind as a model for the framework. AND it’ll actually get done. Other excellent points about this book are the extensive resource lists. These women really break it down with suggested curriculum material. So far, I’ve been quite happy with the recommended materials that I’ve purchased. Their suggestions about how to teach reading also helped me to figure out that the phonics program I was using for Kamikaze was not the right fit and might have had something to do with his reluctance to read despite knowing all the sounds the letters make in addition to being able to code them. There are also useful chapters about managing your time and record-keeping as well as how to go about preparing for college. One caveat. I had purchased the previous edition used, because I didn’t realize that there was a revised version. This wasn’t a problem in terms of understanding the framework presented but it was a problem when it came to the resource lists. There were quite a few items that were out of print and I had to do some searching to be able to buy them. Since that first version was published 1999, both Wise Bauer and Wise have written various books that can be used for the curriculum such as The Story of The World: History for the Classical Child and First Language Lessons for the Well Trained Mind which are obviously not mentioned in that first version. Make sure you get the revised edition or you might just end up spending more money than necessary with one purchase for the old version in addition to one for the revised version. One thing that I’ll probably be writing more about is how to use The Well-Trained Mind with children who have communication difficulties like Tremendo and Sweet Coco. There’s going to have to be some adaptation of the method when it comes to them. For instance the early grades in The Well Trained Mind focus heavily on narration, where the child narrates back to you what you have just read to him. Well how is that going to work when that degree of talking is just not possible for a child? I noticed on The Well-Trained Mind message boards the authors are considering adding a section on to how to use this approach with children with special needs in their next revision. Hopefully this will be addressed. We shall have to see. At this point Tremendo is at the kindergarten level in which there is no narration so I have time to think about alternatives and figure it out. One Response to "Book Review: The Well-Trained Mind"